In June of 2002, a very unusual ceremony begins in a far-flung village in western Kenya.An American diplomat is surrounded by hundreds of Maasai people. A gift is about to be bestowed on the American men, women, and children, and he is there to accept it. The gift is as unsought and unexpected as it is extraordinary.A mere nine months have passed since the September 11 attacks, and hearts are raw. Tears flow freely from American and Maasai as these legendary warriors offer their gift to a grieving people half a world away.Word of the gift will travel news wires around the globe. Many will be profoundly touched, but for Americans, this selfless gesture will have deeper meaning still. 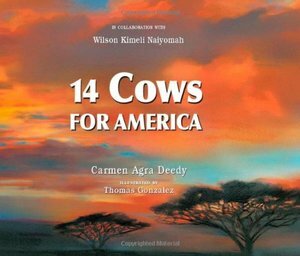 For a heartsick nation, the gift of fourteen cows emerges from the choking dust and darkness as a soft light of hope_and friendship.Master storyteller Carmen Agra Deedy hits all the right notes in this elegant story of generosity that crosses boundaries, nations, and cultures. An afterword by Wilson Kimeli Naiyomah_the Maasai warrior at the center of the story_provides additional information about his tribe and their generous actions. Thomas Gonzalez_s stunning paintings, which are saturated with rich hues of oranges and browns, and blues and greens, capture the modest nobility of the Maasai people and the distinctive landscape of the African plain. I wouldn't have expected a picture book about a Maasai tribe to move me to tears. Deedy never actually mentions the full horror of what happened on the morning of 9/11, and yet the book resonates with the pain and shock felt by so many, around the world. A wonderful, amazing, and unexpected tribute to humanity. As well, it offers an opportunity for discussion for children in a way that isn't traumatic. Perhaps part of what moved me is that the lesson of the book, about people caring for one another, holds true for dealing with any devastating event, such as the earthquake in Haiti.